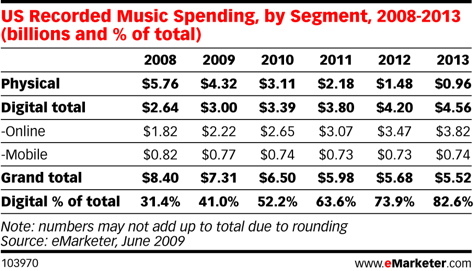 The music industry is in upheaval. Just look at the revenue projections – continued decline. The old model doesn’t work and, in desperation, the industry has tried many new models on for size: a la carte downloads, subscription services, ad-supported streaming. With the exception of iTunes, no one has had runaway success with any of these approaches. So what’s next for the music industry? Look to the clouds. This week, TechCrunch, posted an insightful entry from digital music veteran Michael Robertson on Apple’s secret cloud strategy with iTunes and why their recent acquisition of LaLa is so critical. Like many, I assumed the acquisition was to further the development of the long anticipated subscription-based music service – like Rhapsody, Spotify, etc. Turns out this speculation is far from reality and there is no subscription-based service coming down the pike from Apple. The secret sauce to the Lala acquisition is actually it’s personal music storage service, which provides software to store a personal music library online and then play it from any web browser alongside web songs they vend. The expectation is that Apple will unveil a mobile iTunes sometime in 2010 that will leverage Lala’s technology to copy users’ personal music libraries to the net (or cloud), making it available from any browser or net connected ipod/touch/tablet/computer. Once loaded, users will be able to navigate and play their music, videos and playlists from their personal URL using a browser based iTunes experience. Pretty cool, huh? The cloud-centric model is not lost on others in the space. The acquisition of Lala will just help Apple get there first – again. This entry was posted in Technology and tagged apple, itunes, lala, what's next for the music industry. Bookmark the permalink. Wow. Staggering to see the shift from physical to digital as well as the projected shifts and declines. Though I wonder about the rate of change on shift from physical to digital, if it’ll be that quick and steep. I’ve just started using Lala and did the upload of my iTunes collection to Lala using their native app. So far it’s pretty cool. Playlists are uploaded as well. Takes a little configuring if there are parts of the library you don’t want uploaded (like my own band’s demos and rehearsal recordings and my home recordings), so you have to go folder by folder and exclude. But it’s worth the up-front set up time and the updating whenever you need to.